amends the laws governing school administrative unit reorganization to eliminate the penalties set forth for nonconforming school administrative units. repeals the laws related to the consolidation of school administrative units that were enacted by the First Regular Session of the 123rd Legislature in Public Law 2007, chapter 240, Part XXXX and repeals changes made by Public Law 2007, chapter 668. The bill also restores the laws that were amended or repealed to accommodate the consolidation. provides that a reorganization plan to form an alternative organizational structure must designate a fiscal agent or agents for each of the member entities and municipalities of the alternative organizational structure. The bill also provides that the reorganization plan may designate the alternative organizational structure as the fiscal agent for its member entities and municipalities. ...requires the Commissioner of Education to provide the governing bodies of regional school units and alternative organizational structures with the computation and the amount of the allocation of school subsidy that the commissioner has estimated for the regional school units and each member municipality in the regional school unit or for the alternative organizational structure and each member entity in the alternative organizational structure. ...allows school administrative units to count students who reside in the unorganized territories and attend schools within those school administrative units when submitting a plan for a regional school unit. ...allows school administrative units an additional year to come into compliance with the Maine Revised Statutes, Title 20-A, chapter 103-A, which contains the provisions for regional school units. ...exempts Beaver Cove, Greenville, Kingsbury Plantation, Shirley and Willimantic from minimum student enrollments established in statute for regional school units. The Commissioner of Education is required to treat the communities in a manner similar to the treatment of coastal islands. ...directs the Department of Education to convene a stakeholders group to analyze the school funding formula. The department must present a plan and timeline to the Joint Standing Committee on Education and Cultural Affairs by May 1, 2009 and a report with its recommendations by November 1, 2009. The Joint Standing Committee on Education and Cultural Affairs may submit legislation to the Second Regular Session of the 124th Legislature. ...delays any financial penalties imposed on a school administrative unit for nonconformance with the laws governing the reorganization of school administrative units until the fiscal year that begins on July 1, 2011. ...exempts the towns of Jackman and Moose River, Union 60 and Union 37 from minimum student enrollments established in statute for regional school units. The Commissioner of Education is required to treat the towns in a manner similar to the treatment of coastal islands. ...enacts into law provisions regarding the reorganization of regional school units. The new provisions are similar to the Maine Revised Statutes, Title 20-A, former sections 1405 and 1406 and allow the withdrawal from a regional school unit of a municipality and the transfer of a municipality out of one regional school unit into another. The bill also includes provisions that formerly applied in this area of law authorizing the State Board of Education to review decisions of the Commissioner of Education and to make rules concerning the reorganization of the regional school units. ...establishes the Study Commission Regarding Teachers' Salaries to investigate conditions affecting teachers' salaries in this State, which despite the enactment of a minimum teachers' salary law and substantial increases in general purpose aid for local schools in recent years have not kept pace with inflation and have declined in rank relative to other states in the nation. The resolve authorizes the commission to make findings and recommendations and to submit suggested legislation to ensure that all teachers are paid at rates that are commensurate with their experience, education, professional responsibilities and essential role in the development of the State's economy and human capital. ...a concept draft pursuant to Joint Rule 208. This bill proposes to enact measures designed to improve the essential programs and services funding formula. ...a concept draft pursuant to Joint Rule 208. This bill proposes to enact measures designed to improve the laws governing the consolidation of school administrative units. ...provides additional time for a school administrative unit to comply with the reorganization law if it approved a reorganization plan at a referendum prior to January 30, 2009 but is unable to implement the plan because the plan was rejected by one or more of its proposed partners. The school administrative unit would be allowed to restart the process to form a regional school unit with the same or other school administrative units. ...changes the ratio of students to school administrative staff used to calculate salary and benefit costs to 500:1. It defines "school administrative staff" as principals, assistant principals and special education coordinators. ...eliminates one Regional Education Representative position and one Public Service Executive II position within the Department of Education effective October 1, 2009. ...provides an exemption from the budget validation referendum voting requirements for municipal school units where the municipal charter provides that the municipal legislative body and the school committee are elected bodies and where the municipal charter requires that a public hearing and one or more budget meetings are held on the proposed school budget before the municipal legislative body votes to adopt the school budget. ...amends the laws governing the reorganization of school administrative units to provide that school administrative units located in isolated rural communities may be eligible for an exception to the minimum student enrollment requirements by entering into a collaborative agreement for administrative, instructional and noninstructional functions with another school administrative unit prior to July 1, 2009. ...requires the Commissioner of Education to also provide the governing bodies and the superintendent of each alternative organizational structure with the computation and the amount of the allocation of state subsidy that the commissioner has calculated for the alternative organizational structure and each member entity in the alternative organizational structure and requires that the commissioner issue separate subsidy checks to each of the member entities within the alternative organizational structure. ...prohibits basing teachers' salaries upon the measurable performance or productivity of the teacher or the students of the teacher. ...requires the Commissioner of Education to also provide the governing bodies and the superintendent of each alternative organizational structure with the computation and the amount of the allocation of state subsidy that the commissioner has calculated for the alternative organizational structure and each member entity in the alternative organizational structure. ...This initiated bill repeals the laws related to the consolidation of school administrative units that were enacted by the First Regular Session of the 123rd Legislature in Public Law 2007, chapter 240, Part XXXX. It restores the laws that were amended or repealed to accommodate the consolidation. ...requires the Department of Education to provide a detailed accounting of the amount of subsidy that a municipality in an alternative organizational structure qualifies for under the Essential Programs and Services Funding Act to each municipality in the alternative organizational structure. ... provides for the formation of 20 regional education cooperatives. School administrative units established as of July 1, 2009 may join a regional education cooperative of their choice, and each participating school administrative unit has a single representative to the cooperative board. Participation in regional education cooperatives is voluntary and the participation of participating school administrative units in any of the specified educational functions or support services carried out by the regional education cooperative is voluntary. ...Participating school administrative units voluntarily choose which educational functions or support services they purchase from the regional education cooperative and contribute only for the costs of those educational functions or support services that they use. Savings achieved through the regional education cooperative accrue to the participating school administrative units, with a portion reserved for administrative costs of the regional education cooperative. ...requires the Commissioner of Education to also provide the governing body of alternative organizational structures with the computation and the amount of the allocation of school subsidy that the commissioner has estimated for the alternative organizational structure and each member entity in the alternative organizational structure. ...amends the law concerning the various elements of the "miscellaneous costs" component of the general purpose aid for local schools appropriation, or GPA appropriation. The premise of the bill is that the GPA appropriation should be either a general purpose subsidy to local schools or a state expenditure that provides direct educational services to students who would otherwise be served by the State's public elementary or secondary schools. The bill eliminates the Commissioner of Education's authority to use GPA funds to pay the personnel costs for a range of state employees who work for the Department of Education and provide only indirect support to the public education system. The bill eliminates a similar authority to use GPA funds to pay for the personnel costs of 3 teachers employed by the Department of Corrections. The bill also eliminates the authority to use GPA funds to pay for general education research conducted by the University of Maine, but it retains the authority to use GPA funds to cover a contract with the university to monitor and update the essential programs and services school funding model. [Amendment]: This amendment replaces the bill to incorporate changes in the law concerning the Commissioner of Education's funding level recommendations and the Governor’s recommendations for the annual appropriation to the General Purpose Aid for Local Schools program in the state budget. The amendment requires that the amounts appropriated for certain components of the Essential Programs and Services Funding Act that are proposed in any state budget must be shown in a sufficiently detailed and transparent form and manner to permit the Legislature and the citizens of the State to identify the changes in proposed funding for the components of the Essential Programs and Services Funding Act from the proposed budget without need for reference to other documents or explanations. ...authorizes a school administrative unit to submit an alternative plan when the school unit spends less on kindergarten to grade 12 education than its total operating allocation under the Essential Programs and Services Funding Act for fiscal year 2008-09. This bill also eliminates penalties that would otherwise apply to such school administrative units. ...provides for legislative review of portions of Chapter 131: The Maine Federal, State, and Local Accountability Standards, a major substantive rule of the Department of Education. ...authorizes school administrative units to submit alternative plans in situations when they have been unsuccessful in reorganizing into a regional school unit that meets minimum student population requirements. This bill also eliminates penalties that would otherwise apply to such school administrative units. ...provides that if a school administrative unit adopts a credible budget that is below the maximum state and local spending target under the Essential Programs and Services Funding Act the school administrative unit's required contribution must be reduced by the amount of the savings. 1. The local median household income of each municipality in the school administrative unit is less than the statewide median household income; and. 2. 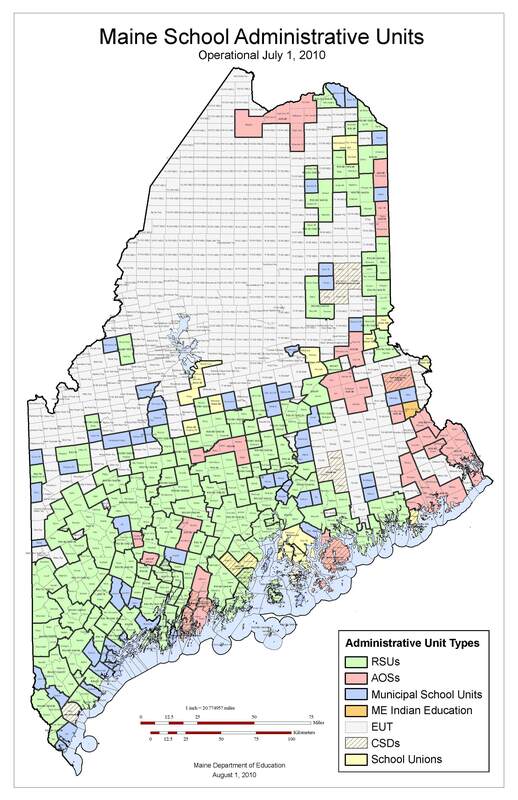 At least 30% of the students in the school administrative unit are economically disadvantaged students as calculated pursuant to the Maine Revised Statutes, Title 20-A, section 15675, subsection 2. A school administrative unit that meets these eligibility criteria must receive an additional adjustment to the state share of its total allocation. ...authorizes school administrative units to submit alternative plans if they have formed alternative organizational structures but have not approved a school reorganization plan. This bill also eliminates penalties that would otherwise apply to such school administrative units. ...requires that, beginning in fiscal year 2010-11, the regional adjustment to the salary and benefits costs of teachers and other school personnel that is based on labor market areas in the State must be 1.0 for all labor market areas in the State. ...requires the Department of Education to review models for performance-based pay and bonuses for teachers, principals and superintendents and to adopt rules authorizing school administrative units to use a performance-based pay model for the remuneration of teachers beginning in school year 2010. ...amends the school budget approval process by allowing a budget to be approved at a school board meeting rather than a district-wide meeting, and then go directly to referendum vote. The bill also changes slightly the wording on the required referendum if a school budget exceeds the maximum state and local spending target. 2. Clarifying the procedures to be followed during a school budget referendum vote regarding the display of informational material in the polling place and the voting booth. ...establishes the Middle School of Science and Mathematics as a public chartered school located on the Blue Hill peninsula to provide students with a challenging educational experience with an emphasis on math and science. ...dissolves the State Board of Education on July 1, 2010, and directs the Department of Education to study and recommend legislation to transfer the powers and duties of the board to other agencies in anticipation of the dissolution. [amendment]: ...replaces the bill with a resolve to establish a stakeholder group to review the role of the State Board of Education and submit a report and recommendations to the Joint Standing Committee on Education and Cultural Affairs by December 1, 2009. The Joint Standing Committee on Education and Cultural Affairs may introduce legislation to the Second Regular Session of the 124th Legislature. The amendment also changes the bill title and incorporates an emergency preamble and an emergency clause. [amendment]: ...adds 2 additional legislative members to the stakeholder group and clarifies that the President of the Senate and the Speaker of the House are to appoint all members of the stakeholder group and that the first appointed members of the Senate and the House of Representatives are to serve as cochairs of the stakeholder group. ...adjusts the subsidy for special education for those school administrative units that are minimum receivers of state subsidy by reducing the transition percentage for special education costs to 25%. ...adds provisions to the school reorganization laws regarding employment and collective bargaining for school units that reorganize as alternative organizational structures and that decide to consolidate employment at the alternative organizational structure level to perform services, programs and functions in addition to administration of those services. These provisions are modeled on similar provisions in the laws that apply to regional school units, which were omitted from the portion of the laws that apply to alternative organizational structures. The bill also adds similar employment and collective bargaining provisions for employees of school unions who are now represented by a bargaining agent, which were also omitted from the school reorganization laws. ...amends standards for student assessment, basic school approval, the elementary, middle and secondary courses of study, the comprehensive program of study for the high school diploma and the Department of Education diploma in order to more fully implement the parameters for essential instruction and graduation requirements. ...bill clarifies the obligation and financial responsibility of regional school unit boards of directors for preserving the opportunities for choice of schools for students who reside in a municipality in a regional school unit that was a previous education unit that sent students to another school administrative unit. The bill provides that when one or more member municipalities continue to send students to a school outside of the new regional school unit, the regional school unit is responsible for the tuition expenses for the students who are educated outside of the regional school unit. ...requires the Department of Education to develop and maintain the Maine Statewide Longitudinal Data System. The purpose of this system is to improve the ability of the Department of Education to conduct longitudinal data studies by permitting the use of student social security numbers for the tracking of individual student enrollment history and achievement data over time. Data must be collected and used in compliance with the federal Family Educational Rights and Privacy Act of 1974. 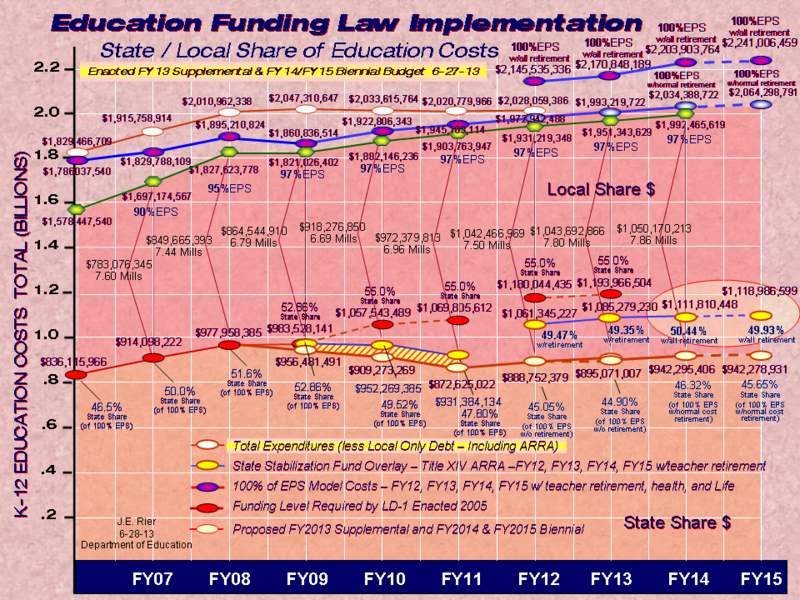 ...allows a school administrative unit to exceed its maximum state and local spending target under the Essential Programs and Services Funding Act by the higher of 5% over the state and local spending target or an amount equal to the unit's previous year's budget multiplied by the rate of growth of the current year's maximum state and local spending target over the previous year's maximum state and local spending target without having to have the amount approved by referendum. This bill creates new referendum language for a school administrative unit that exceeds its maximum state and local spending target. ...establishes a process to authorize the establishment of charter schools in the State.